Montego Bay, Jamaica (February 12, 2015)– The Oakcliff Racing Team crossed the finish line of the 2015 Montego Bay Race for the Pineapple Cup at 23:28:21 February 10th. After jostling with another class 40, Amhas 2, for most of the race. Oakcliff’s Elizabeth Shaw and Jeff McFarlane finished strongly with a 2nd in class and 4th overall result and a total elapsed time of 4:10:23:21. The only major hitch came after the finish when the motor decided to quit and they began drifting toward a reef. 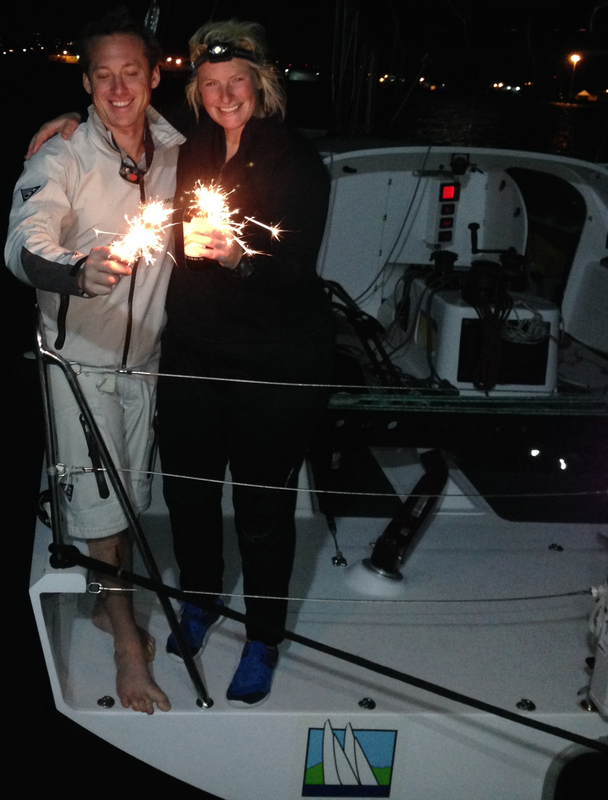 Once safely at the dock, sparklers, Red Stripe and a celebration followed. As for her thoughts on the team, she shared: “Jeff is known for his single-handed sailing and a serious demeanor while I am the opposite but on the boat, that switched. Jeff is a lot funnier than people think and I, more serious. That is one reason we were a great team. Our personalities met in the middle”. Oakcliff congratulates Amhas 2 for a well-sailed race! Gill, Oyster Bay Marine Center, Awlgrip, Harken, Marlow, Spinlock, Hammer Human Performance, B&G, Expedition Marine, North U, Katadyn and PSA Inc.